This beautiful Blanket Chest can also be used as a Hope Chest or Keepsake Chest instead of storing blankets and quilts. The classic, elegant look of our Versailles Chest is sure to inspire awe in your entire bedroom suite! The Amish Versailles Blanket Chest comes with an aromatic cedar bottom and a soft close hinge. 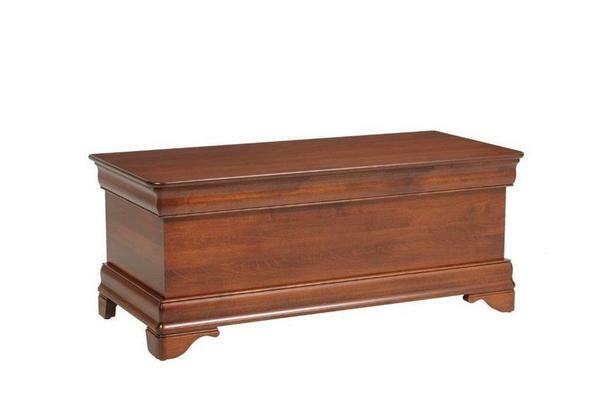 This solid wood blanket chest is shown brown maple wood with a mission maple finish. Please call on of our Amish Furniture Specialists to receive finish samples for our Amish handcrafted Blanket Chests.